Valencia boss Gary Neville says he is "committed" to the Spanish club and is not using them as a stepping stone to the Manchester United or England roles. The 40-year-old, is also assistant to England coach Roy Hodgson, and played 602 games for United. "Me being England or Manchester United manager in six months - I can assure you it's not going to happen," he told the Daily Telegraph. 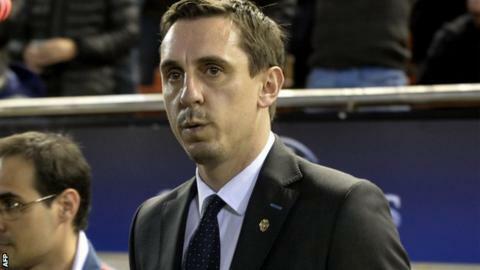 Neville has overseen five matches as Valencia boss, beating third-tier Barakaldo in the Copa del Rey, securing draws against Getafe and Eibar in the league and losing to Lyon in the Champions League and, on New Year's Eve, Villarreal in La Liga. Next up, they face Real Madrid on Sunday at home (19:30 GMT). Manchester United boss Louis van Gaal is under pressure, with the the Red Devils without a win in eight matches - their worst such run since 1990. However, Neville says he does not expect to be offered the job. "It's not going to happen in terms of people offering it to me and it's not going to happen in terms of me taking it," he added. "The idea that I have taken this job so I can pounce on one of those other two jobs - it's absolutely not true." Neville has been appointed Valencia boss until the end of the season but said "if it goes really well then I could be here for six years". He added: "How I move on from here - who knows? But my commitment is there. The commitment with the family is there - the kids have got a new school. I plan to be successful. You can't plan on being a failure." Hodgson's England contract runs out in July with the Football Association set to discuss an extension after the team's campaign at Euro 2016. There will be live text commentary on Sunday of Valencia v Real Madrid (19:30 GMT kick-off).